Really. It's that good. And I made it up myself. Well, I started with a recipe and kept changing it and changing it until I hit on this combination and haven't changed it since. This is what my family eats. I promise it's delicious. Makes 6 loaves. If I had two ovens and a few more bread pans I'd double it, but you can half it or 1/3 it or whatever for your needs. 1. 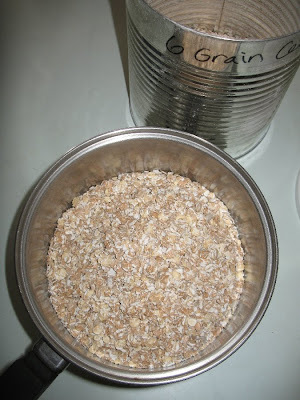 Put the 4 cups rolled grains in a pot or bowl that holds more than 4 cups. I use a pot because I don't actually measure the stuff, I just know about where on the pot to fill it to because I've used this same pot for the grain part of this bread forever. 2. 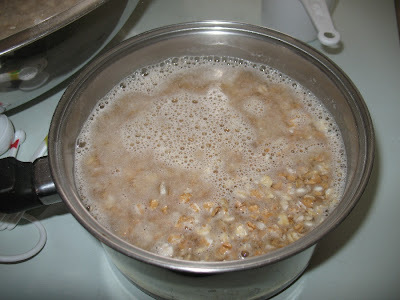 Pour hot water over the grains until they are covered by about an inch of water. Hot water from the tap is fine, you don't need to go heating water for this. 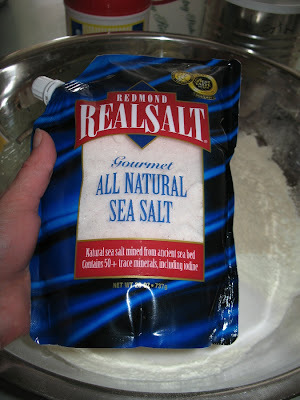 Then set it aside to soak. I set mine on the stove because I have limited counter space--I do NOT turn the stove on and cook it, it just sits there. 3. 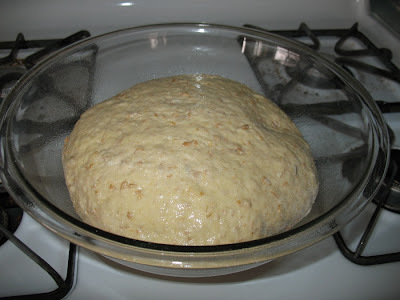 Put the 1 1/2 Cups of warm water, 2 TB yeast, and 1 1/2 tsp sugar in a bowl and let the yeast do it's thing. 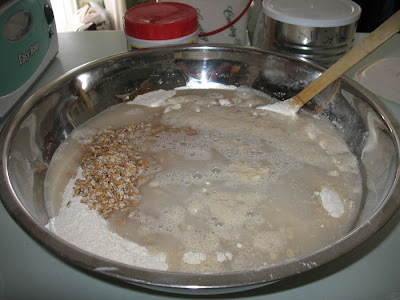 It's okay to stir it around a bit just so all the yeast gets in the water. 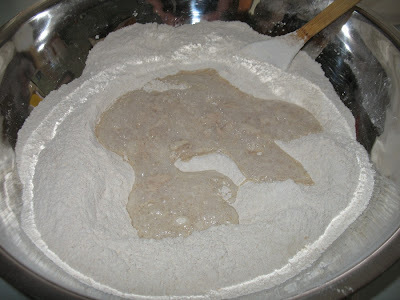 The bean flour is ground from white beans. It just makes it so my kids are eating beans without knowing it. With a standard electric impact type grain grinder you can just grind beans up. My mill has a corn/bean auger to grind beans into flour. 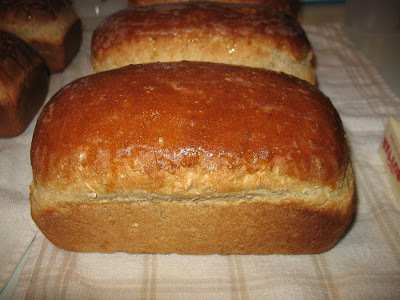 The gluten flour makes the bread hold together better. Gluten=Glue. 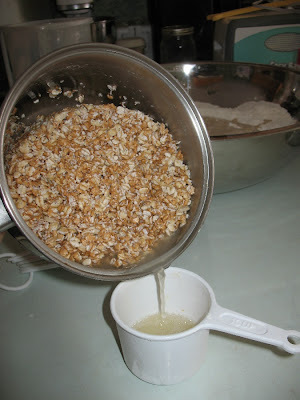 If I use all white flour or don't use the rolled grains, I use less gluten flour than 1 cup. You don't have to measure exact tablespoons of the shortening--what a hassle getting that stuff out of the measuring spoons! Just put 6 scoops that are approximately tablespoon sized. I promise you won't mess it up if you're a little off. 6. Now all your dry ingredients are in the bowl, mix them together. It's okay if the scoops of shortening don't get mixed up yet. 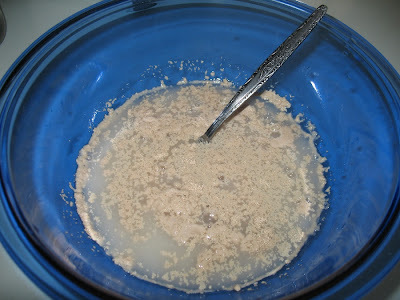 The yeast mixture should be nice and bubbly by now--add it to the bowl. 7. Now we're going to add the 5 cups of warm water, but don't go turning on your faucet just yet. Go get your pot of soaking rolled grains. 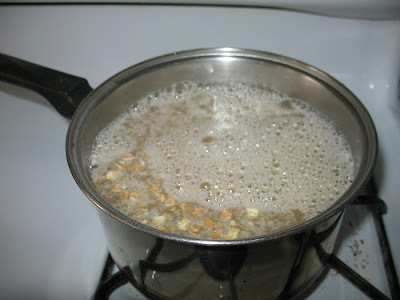 Pour the water off the soaking grains into your measuring cup until you've poured it all off as best you can. Yes some of the grains go along for the ride, it's okay. This is not rocket science. 8. 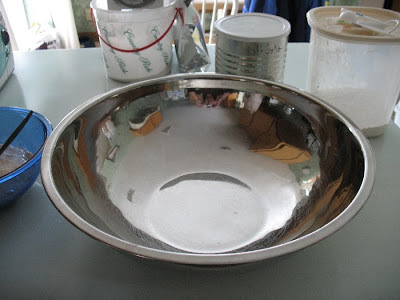 Once you have the water measured off your grains, add them to the bowl as well. About this time I turn my oven on warm because I use it to raise my dough. If you've got a fairly warm place without using your oven, you don't need to turn your oven on yet. 9. 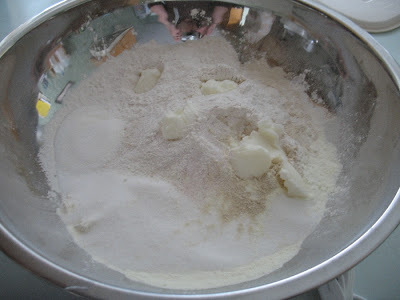 Mix it all up and add enough of the remaining flour to make it stick together fairly well. Now we're going to knead it. Some folks are all kinds of fancy and have a mixer that will knead bread for them. Mine will only do about two loaves worth at a time, so I just knead this myself. 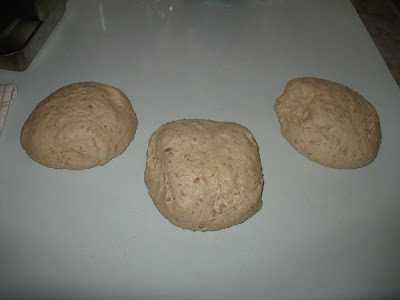 I divide it into two parts that will be three loaves each for the kneading. It makes it easier to work with and it works out better for the bowls I use to raise the bread in if it's only half the recipe in each bowl. I also move from my counter to my table to knead. You've got to be able to get leverage on the dough, and the counter is too high for me. See if you can lock your elbows with your hands together (CPR style) and reach your kneading surface without needing a stool. If so, it will work better for you. When the table's been busy with homework or whatnot, I've used the counter, I just get a little stool so I'm up a little higher to make it easier. Whew. Got all that? Just trying to make kneading a little easier for you! 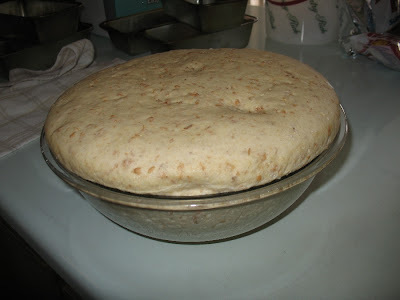 :) Here's what the dough looks like when I'm done mixing it in the bowl and it's ready to knead. 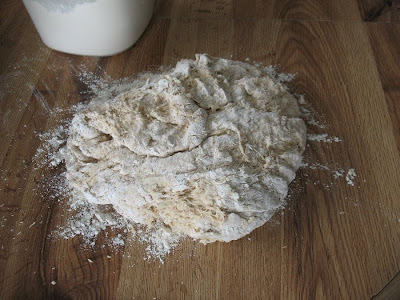 I'm not giving kneading instructions here as I was my own photographer and it's kind of difficult to knead and take pictures without getting flour and dough all over the camera, so after I knead the dough, here's what it looks like. I have no idea how long I knead each half. I just keep kneading until it's nice and bouncy and kind of pushes back when I push on it. Not sticky. Okay? 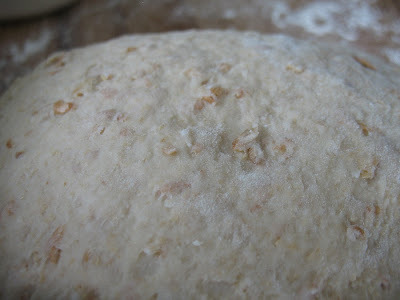 And just for Chef Tess, here's a closeup of the kneaded dough where you can see the yummy rolled grains all mixed in there. 10. 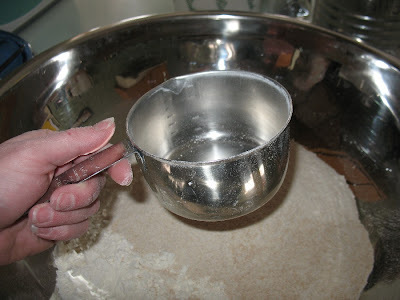 Spray oil a bowl and put your nice ball of dough in it. 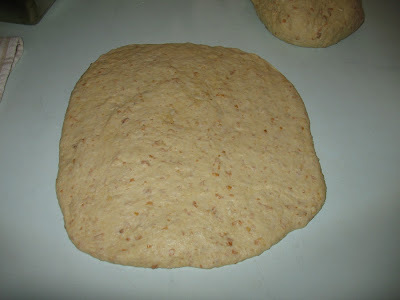 Then spray the top of the dough with the spray oil, cover it, and put it someplace warm to rise. I cover it with a dishcloth. That's just how my mom did it. I don't know if it's the best way or not, but it works for me. 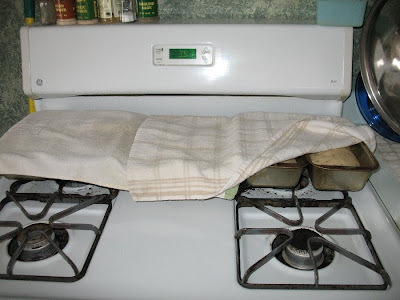 I also use my oven to raise the bread in. I already had it turned on low or warm setting about the time I started mixing up all the ingredients, now I turn it OFF and put the dough in to raise. 11. Wait. Here's where you can clean up the mess you've made so far and go do some jumping jacks or whatever floats your boat for 20-30 minutes or so. The bread is raising. You want it about double in size, but if it gets bigger than that it's okay. I've had it hanging over the edge of the bowl before. The bread still turned out fine. So once it's at least double its size, it's done raising. Beautiful. 12. 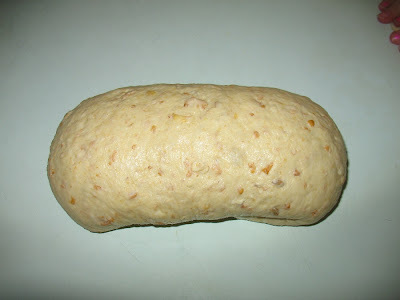 Shape the dough into loaves. There's probably a million ways to shape a bread loaf. Here's what I do. 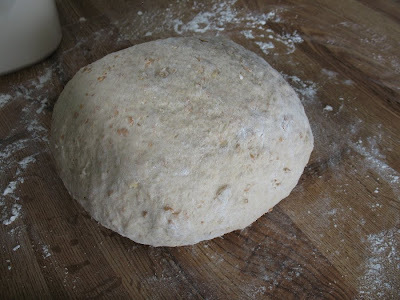 Press out the air while shaping one of the dough balls into a rectangular shape about as wide as a bread pan, maybe a little wider. I kind of roll my hands from the bottom to the top to get air bubbles out--you could use a rolling pin if you want and get the same effect. I just don't like washing more dishes than I need to, so I press it out with my hands. 12. Then put it in your greased bread pan. I use el-cheapo bread pans and spray oil. They work fine. I don't wash them out after I bake bread in them, I just wipe out any residual grease and they're ready to go for the next round. Maybe that's unsanitary, but they've become nicely seasoned this way--like cast iron. 13. Put the loaves somewhere to rise. I turn my oven on to pre-heat and put them along the back of the oven because that's where the oven vents so it's nice and warm. Cover them again. I use the same dish cloths I used earlier. Wow, I think this is one of my longest posts ever. If you are still reading, you are awesome! Hang in there, we're almost done! Let the bread raise in the loaf pans for 20 minutes or so. 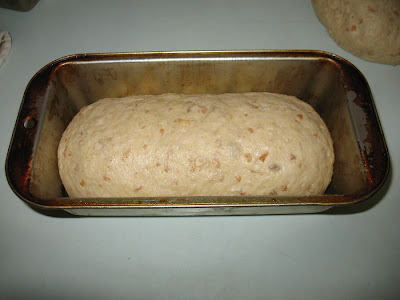 It depends on how warm you have your raising place as to how fast the loaves will raise. 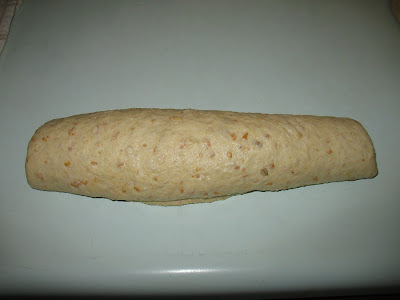 Don't let them raise until they look like a loaf of bread--they do some more raising in the oven, so that will make for "airy" loaves where the bread doesn't stick together very well. About like this is fine. 14. Put your bread in the oven and cook it at 350 for 40 minutes or so. 40 minutes is perfect in my oven. 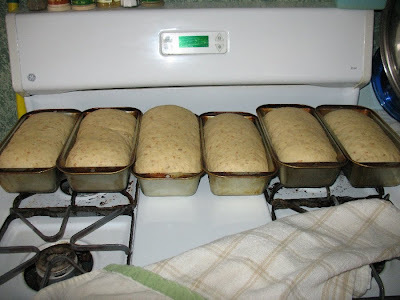 Then take the loaves out, get them out of the pan, and let them cool. I usually just set them out on the same dish cloths I used to cover them. Multi-purpose. I rub butter on the top while they're hot to soften it up a bit. Super delicious. Making me hungry . . . I think I'll go have some bread and jam now.